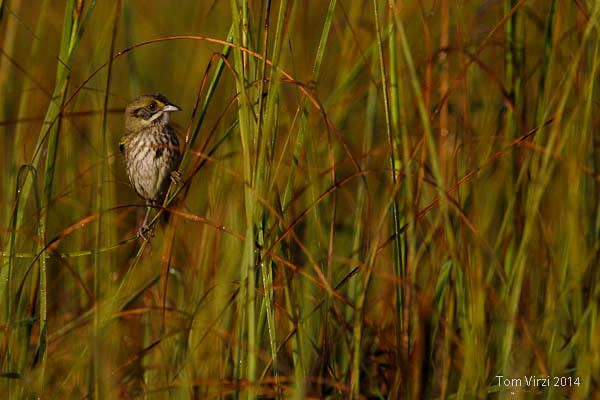 The recovery of the endangered Cape Sable seaside sparrow (Ammodramus maritimus mirabilis) is of central concern to the ongoing restoration of the Florida Everglades. The Cape Sable seaside sparrow (CSSS) is a federally-endangered subspecies with a distribution restricted to the seasonally-flooded marl prairies of the Everglades. 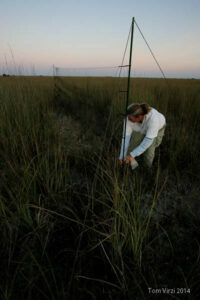 The loss or degradation of the sparrow’s marl prairie habitat due to past water management actions in South Florida has led to a decline in the population raising major conservation concern. 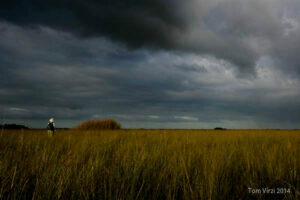 The Comprehensive Everglades Restoration Plan (CERP) is the overarching plan to return a more natural quantity, quality, timing and distribution of water (i.e., ‘getting the water right’) to the Everglades. Under this plan, ‘getting the water right’ is thought necessary to facilitate recovery of a suite of threatened species, including the CSSS. With this in mind, long-term research and monitoring on the sparrow has provided key information for both potential measures to help achieve recovery goals and real-time feedback so that managers charged with making seasonal water flow decisions have relevant information to do so. Presently, Ecostudies Institute continues to lead CSSS monitoring efforts to provide the information necessary to aid in the recovery of this endangered species. The Central Everglades Planning Project (CEPP) is the next generation of proposed projects to be implemented under CERP. One goal of CEPP is to identify and plan for projects on land already in public ownership to allow more water to be directed south to the central Everglades, Everglades National Park (ENP) and Florida Bay. Although this project is expected to produce large-scale hydrological benefits, there is also trepidation about its potential impact on endangered species, including the CSSS, whose range is extremely limited and population very small. The goal of this project is to continue monitoring of CSSS populations found in ENP, and on adjacent lands managed by the South Florida Water Management District (SFWMD). With planning and recovery discussions for this endangered species expected to continue over the next year, this project will maintain continuity with previous research and monitoring, and begin to evaluate and consider previously recommended and new opportunities for recovery. During 2017, the specific monitoring objectives of this project were: 1) to continue ongoing monitoring in CSSS subpopulation A, which is considered perhaps the most vulnerable subpopulation, 2) compare demographic parameters with those from a high-quality reference subpopulation (subpopulation B), and 3) to assess the effects of the SFWMD’s C-111 Spreader Canal Project on subpopulation D which is located outside the boundary of ENP. We are also currently developing a spatially-explicit population estimator using available long-term data in order to derive a more accurate range-wide population estimate for the CSSS than is presently available. Below we report some key findings from our 2017 field season monitoring Cape Sable seaside sparrows in Everglades National Park and adjacent lands. In 2017, we monitored sparrows breeding in four subpopulations (A, B, C and D). We report the following preliminary demographic data from each subpopulation monitored in 2017 (# males; # females; # nests found): A (8 M; 8 F; 14 nests); B (32 M; 13 F; 17 nests); C (23 M; 16 F; 15 nests); and D (9 M; 2 F; 1 nest). Apparent nest success rates (% nests hatched; % hatched nests successfully fledging at least 1 nestling) were as follows: A (50%; 86%); B (80%; 75%); C (73%; 64%); and D (100%; 100%). Overall productivity (total # nestlings fledged) on each study plot was as follows: A (12); B (22); C (19); and D (3). As part of our demographic monitoring, we continued to mark and recapture adult and juvenile sparrows on our study plots. Preliminary mark-recapture data (# CSSS banded; # CSSS resighted) were as follows in 2017: A (12; 13); B-DL (7; 2); B-AH (32; 13); C (42; 0); and D (6; 3). We also color-banded sparrows (6 adults; 6 juveniles) in subpopulation E in anticipation of adding a new demographic study plot there in 2018. In addition to our demographic research, during 2017 we conducted additional CSSS surveys in areas outside of our long-term demographic study plots. We conducted point count surveys in areas directly adjacent to our long-term demographic study plots in subpopulations A, B and D, and we added survey sites in our new demographic study plot in subpopulation C. We also conducted additional surveys at new sites in subpopulation E in areas where we anticipate placing a new demographic study plot in 2018. In total, we conducted 169 point count surveys at 57 sites (2-3 replicates) located in subpopulations A, B, C and D; we also conducted 28 surveys at 14 new sites (2 replicates) in subpopulation E. Our point count surveys included several methods to estimate CSSS detection probability and density, which will be compared to estimates provided by the ENP rangewide helicopter surveys to help refine the population estimate for the CSSS. Methods incorporated into our point count surveys included distance sampling and time-of-detection sampling. Presently, we are analyzing these data as part of our continued work towards developing a spatially-explicit population estimator for the CSSS. Follow the status of the project by watching our Field Blog, or by visiting our Facebook page. Sign up for our e- newsletter! 2 or 3 times a year we will send you an email highlighting our latest projects and most recent discoveries.